Note: This post was originally published on Eat Boutique. Grilled cheese is my life. Or it was from the ages of 2 through 12. Back then I would happily have eaten a grilled cheese with a glass of milk for lunch every single day. If that meal was then followed by a Today’s Special marathon (especially if it included the Muffy gets her tonsils out episode and an hour or two of Barbie doll accessory organization then I was the happiest kid on the block. Unfortunately, it seems my mini-diva self wasn’t very kind to my sandwich chef aka grandma. I don’t recall how the habit began, but at some point I routinely started telling her in a singsong voice, “If you burn it, you’ll eat it!” Which, at the time I thought was absolutely hysterical and which now sounds utterly horrifying and beyond rude. Could I have been more of a jerk? Especially considering that my grandmother always grilled my white Wonder Bread and orange Kraft Singles into perfect, toasty brown submission before cutting the gooey mess into 9 neat and tidy squares. The squares were very important to the whole grilled cheese process. I would methodically eat the outer toasted ring and save the middle crustless piece (the crown jewel if you will) for last. Sometimes I still eat my sandwiches in this manner. But not for this recipe. The catalyst for seeking out this off-the-wall take on grown-up grilled cheese sprung from a jar of Plenty Spicy Jalapeño Inna Jam that I was gifted for pitching in on their Kickstarter campaign. Oh man. Is that stuff amazing. In addition, I’ve been eating my weight in strawberries recently but that’s really only a coincidence. My brain definitely did not make the leap from pepper jelly to strawberries nor would it ever without the aid of Google. So thanks for pointing me to the following recipe which incorporates things that made me raise my eyebrows in disbelief, but which actually tastes like someone smashed summer on my sandwich. You absolutely have to try this. I’ll be flying home to Maine next month and I definitely will be making one of these for my much deserving grandmother and I sincerely hope that she admonishes me with the same “if you burn it, you’ll eat it” mantra that I used on her for so many years. Erin’s Note: This goes completely against the traditional method of making grilled cheese, but in the interest of aesthetics and because there is such a large amount of ingredient layers in this recipe, I recommend grilling your bread separately, then assembling the sandwiches, but it’s totally up to you. Instructions: Spread goat cheese on 1 side of 3 bread slices. 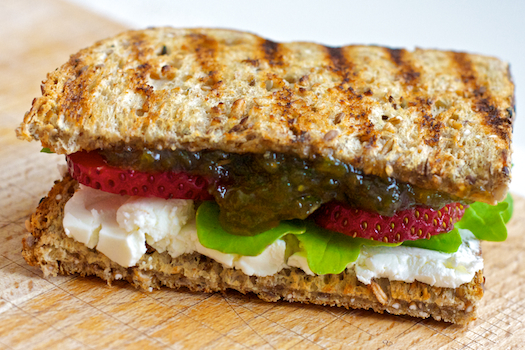 Spread pepper jelly on 1 side of remaining bread slices; layer with strawberries, basil leaves, and watercress. Sprinkle with salt and pepper to taste. Top with remaining bread, goat cheese sides down. Cook sandwiches in a large, lightly greased nonstick skillet over medium heat 2 to 3 minutes on each side or until golden brown. THIS GRILLED CHEESE LOOKS MAGICAL. I used all caps, so you know I’m serious.